When you think about a dinner with wine pairings, wallet-friendly is not usually the first thing that comes to mind. We've done food and wine match-ups on NK before (check out the last one HERE), but today, we're doing one with an eye towards budget. Who says elegant and delicious has to equal super expensive? You can create a top-notch, company-ready meal with wine without spending an arm and a leg. 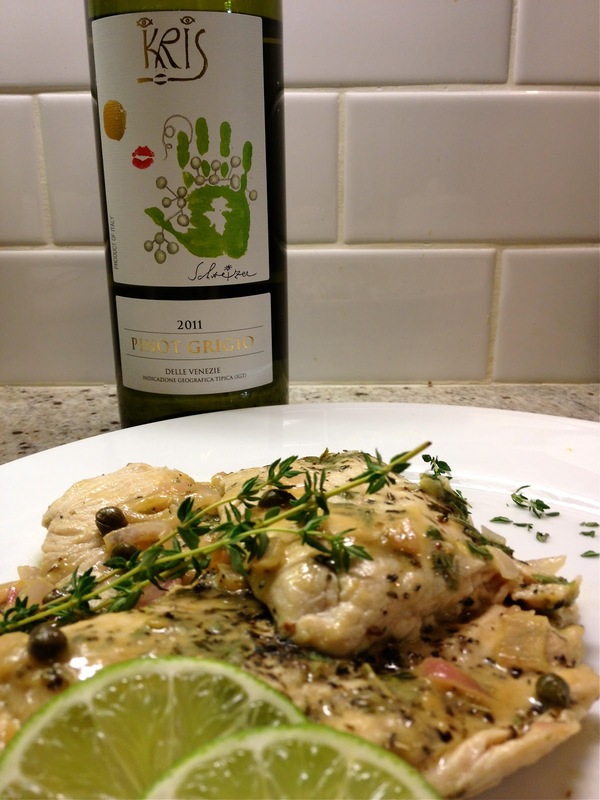 We'll be adapting an innovative take on Turkey Piccata found in Sid Goldstein's, The Wine Lover's Cookbook. The book was gifted to me by my thoughtful friend, Missy, who, as with all things, has been incredibly supportive of my cooking and blogging obsession. She's also undoubtedly noticed my love affair with wine! 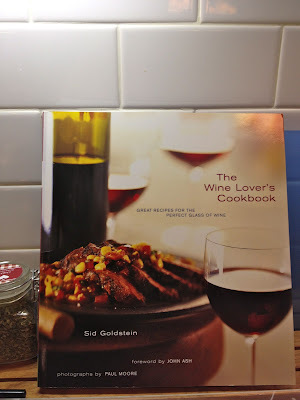 I highly recommend this cookbook for its exhaustive yet simple presentations on various wine types and styles, explained straightforwardly alongside comprehensive lists of the "base" and "bridge" ingredients that pair best with each varietal. The result is a book that makes it easy to create fantastic food and wine pairings. Also, to save you the guesswork, every different chapter also offers multiple recipes that pair with the type of wine highlighted in each. Turkey doesn't get much attention here on NK, so I figured I'd give the bird a chance, and it didn't hurt that Goldstein's recipe looked positively elegant. I, for one, tend to forget that Turkey really is a great option when you are looking for a healthy, budget friendly protein. Take this recipe for a spin and I hope you'll find the results are, indeed, fantastic. Even better, this dish is done in a flash - 25 to 30 minutes should cover all the chopping, prep and cooking. Trust me, you can't mess this up. Before we fire up our burners, here are your Recipe Pointers and of course, your Pairing. Today's dish comes together quickly, so it is important that you chop and prep everything in advance: prepare the Spice mix and dust it on the Turkey Cutlets, premix the Wine, Mustard, Worcestershire, Lime and Caper mixture, and only then, turn on the stove. From there, you'll be all ready to serve dinner in only about 5 or 7 minutes. This recipe calls for wine in it as well as with it. You are more than welcome to use an even cheaper bottle for cooking, though you can certainly use part of the pairing bottle as the dish only calls for a third of a cup. 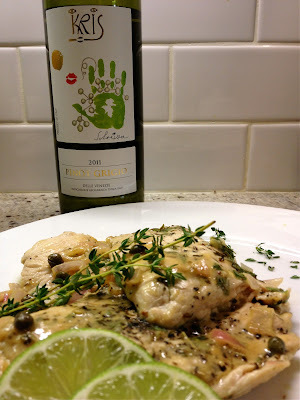 As Goldstein's book will tell you, this dinner's best pairing is a nice Sauvignon Blanc, yet because of the piquant, citrusy character of our Turkey dish, it is also a natural match for a boisterous Pinot Grigio. The recipe will pick up some of the herbaceous aromas of Citrus, Thyme, and other fresh herb aromas often found in the Pinot Grigio varietal. I opted to serve Pinot because it's what I had on hand, and I happen to really enjoy the budget bottle I am about to recommend. I often purchase Kris Pinot Grigio because it is a great, widely available, value bottle. As noted by Food and Wine's critic, Ray Isle, Kris Pinot Grigio offers more "personality" and I think, complexity, than other bottles in its similar price range. Kris Pinot Grigio retails for 13 to 14 dollars but you can also find it on sale as well. 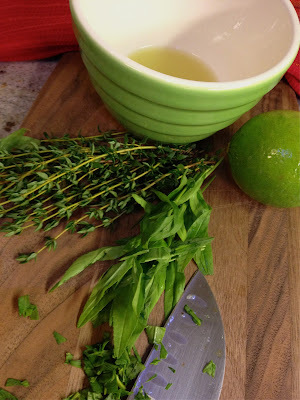 In a small bowl, mix Basil, Tarragon, Thyme, Rosemary, Salt, Pepper, and Flour. Mix well. Place Turkey on waxed paper, parchment, or another surface and dust the Spice and Flour mix on both sides of the cutlets. In another small bowl, mix the 1/3 cup of Wine, Dijon Mustard, Lime Juice, Worcestershire, Tabasco and Capers. Mix well. In a very large non-stick saute pan, heat the Olive Oil over medium-high heat. Add Shallots and Turkey Cutlets and cook for about 2 minutes before turning. Add the Lime Juice, Wine and Caper Mixture to the pot and continue to saute for another 2 to 3 minutes. Remove Turkey to a plate and tent with foil to keep warm. Deglaze the pan with 3 Tablespoons of White Wine, scraping the bottom and mixing. Simmer the sauce for an additional two minutes so that it can reduce a bit more. To serve, plate the Turkey Slices and top with Pan Sauce. Garnish with Fresh Thyme and Lime slices. Don't forget to serve that lovely wine. Hello, all. The past few days have been majorly eventful. I'm happy to report that the Christmas Eve Seafood Dinner we hosted could not have gone more swimmingly. As if that weren't enough, we enjoyed time with our families and were treated to a fantastic Christmas Day dinner of Prime Rib at my Mom-in-law's. Needless to say, our diets will start on January 2nd. Where to begin? Well, we served six (rather than the traditional seven) fish dishes for Christmas Eve. They all came out great, on time, and paced just right for a marathon food-fest. In the end, everyone was pleasantly full but not stuffed. As in most kitchens, neurotic or otherwise, we did experience a few minor snafus prior the arrival of our guests; for one, our favorite bakery ran out of the Semolina Bread I wanted for my Clam Appetizer, and I will admit, I momentarily lost it (we're talking tears here) when I discovered that the Calamari I had ordered did not meet with my approval (too big!). Luckily, my husband had time to go to the next town and was able to replace it for me - and my bread, because by that time, I think I had made him afraid. When hosting a multi-course meal, there will always be bumps in the road - your best bet is to build in time to address the inevitable Murphy's Law moments that will arise. Today, I will share our entire menu, as well as our planning and prepping schedule, and special tips so that you too can make this seafood feast without breaking a sweat. 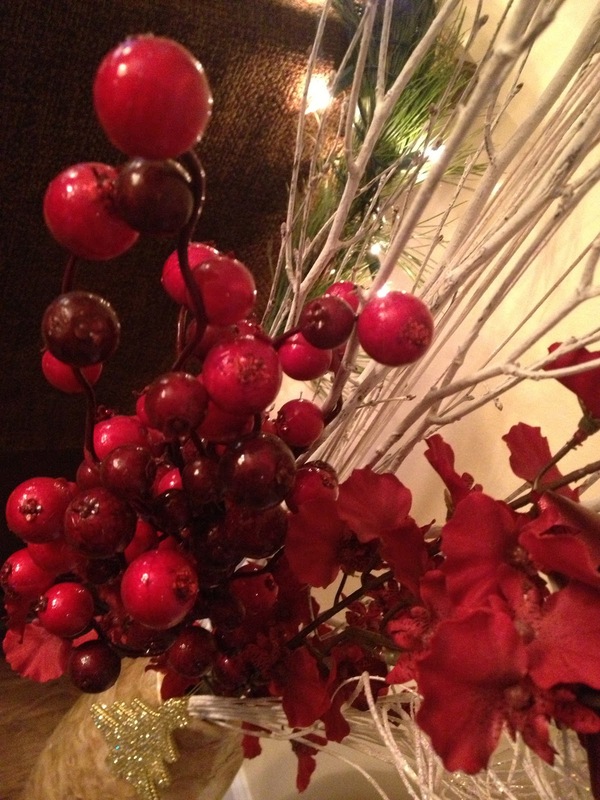 Here's to a great 2013 and I look forward to cooking with you in the New Year! II - The Dishes - photos of the food, plated and ready, as well as when to serve each dish. IV - The Battle Plan - for the days leading up to the party and straight through its conclusion, a blow-by-blow of all the advanced planning, what to do, and most importantly, when to do it. 6 Medium Marinated Bocconcini Mozzarella Balls, ideal is about 1 or 2 per person*. *If you can't find Marinated Bocconcini, just let the Mozzarella Balls sit in the fridge for at least a day in Olive Oil and Seasonings of your choice. 6 -10 Sweet and Spicy North African Red Peppers (we used a brand called Pepper-A-Fancy) or Sweet Red Cherry Peppers in Vinegar would work as well. 2 large, bushy sprigs of Rosemary, woody stalks still attached. To assemble, simply place your Rosemary Sprigs in a circular manner across the edges of a round platter. To get the long stalks to become round, partially break the woody stalk (not all the way) in several inch increments. This will allow you to bend and shape it into a Wreath arrangement. Place second Rosemary Stalk on the plate to fill in any open areas of the border, or to add thickness to the existing stalk, You may also break off smaller sprigs from any extra Rosemary to fill in spots on the circle that require more fullness. Place Mozzarella balls as pictured across the wreath, and fill in remaining spaces with clusters of Olives and Peppers, nestling them into the Rosemary leaves to secure. If not serving the Wreath immediately, cover with saran and refrigerate. This should be brought to room temperature outside the fridge about an hour before serving. To plate, top Cocktail Blini with a dollop Creme Fraiche. Spread Creme Fraiche into a flat circle, leaving some of the Blini edge uncovered. Top with the Salmon Mixture and dot with optional Zest Strip and a sprig of Fresh Dill. If not serving immediately, cool in the fridge up to an hour and allow to sit a few moments outside the fridge before putting out. The ideal temp for this hor's d'oeuvre is just a smidge cooler than room temp, but not fully chilled. Enjoy! Note - I like to serve this more substantial starter in the living room at the end of cocktail hour as a way to kick off the seated meal - that's why I call it a "transition dish." Sometimes I prepare these individual cocktails in martini glasses to make them feel extra special, but this year I used small footed dessert dishes that worked perfectly. Chopped Chives - for an optional garnish. Several hours before your party, take one can of chilled, pasteurized lump crab, rinse carefully, and pick through the meat to check for any shells. Gently pat dry crab and toss with salt and pepper to taste plus a the juice of 1 lemon. Just before serving, line glasses with a some of the Frisee. Boston Lettuce or Hearts of Romaine work well also. Fill glasses halfway with 7 or so pieces of Lump Crab. To finish, garnish with optional chopped Chives and add a Lemon Wedge to the side of each glass.Sprinkle a little finishing salt on them. Serve the cocktails and and put out a communal bowl with cocktail sauce and another with extra horseradish. Take out six large soup or pasta bowls for serving and cut 6 large hunks off the Bread that are sized to fit nicely in the base of the bowl. Next, cut the tops off the Bread. Rub each piece with half of the Garlic Clove, spread on a bit of Butter, and sprinkle generously with Grated Parmesan, pressing the Cheese into the Butter to affix. Toast Bread in the toaster oven or regular oven until golden. This is how you create your “Crouton.” Place each flavored "Crouton" in the base of your serving bowls. Set aside. In a large, heavy bottom pot, heat Oil and Butter over medium low heat. Once the Butter is melted, add the minced Garlic and cook until fragrant, about 1 or 2 minutes. Do not burn the garlic. If the garlic burns, it is not a bad idea to discard and start over. Next, add the two cans of Chopped Clams with their juices to the pot. Turn up the flame to medium. Add 1 cup of the Dry White Wine Heat until the liquid begins to bubble a bit.Add 8oz (the whole bottle) of Canned Clam Juice, your Black Pepper and Crushed Red Pepper to taste. You can prepare the recipe in advance up to this point. To store, cool the mixture to room temp and place in the fridge until ready to finish. This can sit overnight in the fridge if need be. 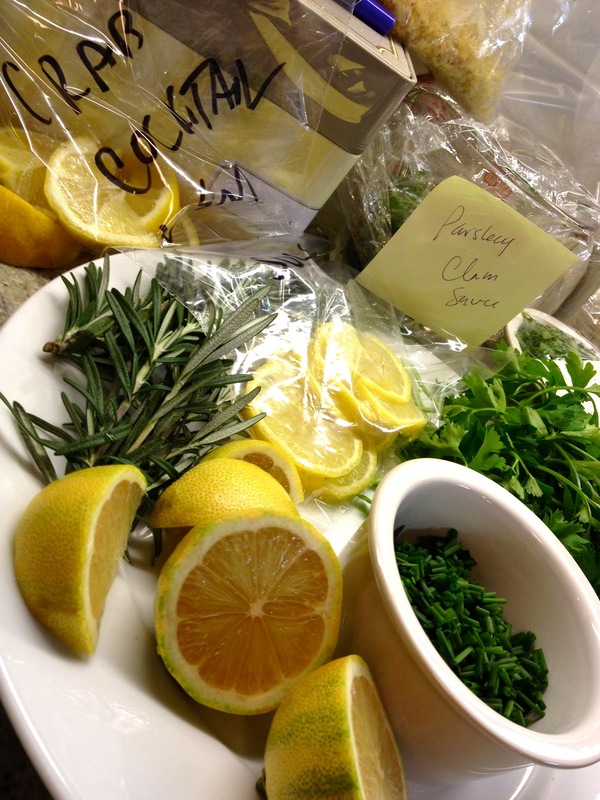 When ready to finish the dish, return the reserved Clam Mixture into a large, heavy bottom pot. Throw in the remaining 1 Cup of Dry White Wine and bring the liquid to a light boil. Add all the Fresh Clams. Cover the pot and cook for 4- 6 minutes, checking on the Clams frequently as they will begin to open. When they pop open immediately pick them out one by one using tongs and transferring into a separate large bowl. This is because if you leave Clams in too long after they’ve opened they will dry out and get rubbery. As you pluck out Clams one by one, give the pot a stir to create room for remaining clams to open. Discard any Clams that do not after a reasonable period of time. To Assemble: Place Fresh Clams on and around the Crouton base as pictured. Pour generous amounts of Broth and Chopped Clams from the pot over each bowl. You’ll want there to be a good inch of Broth in each bowl, if not more. Sprinkle with a bit more Crushed Red Pepper if you like, and top with Chopped Parsley. Serve right away. Enjoy! Note: If you like, you can prepare this the evening before and let it sit in the fridge overnight. When ready to serve let sit on the counter for 5 minutes, toss, and stir in fresh parsley. Method: In a very large skillet, warm the 4 Tablespoons of Olive Oil over medium-high heat. Add the Garlic and saute until fragrant, about a minute. When ready to serve, toss, and garnish with Parsley. Serves 6 as an Appetizer Make Ahead ~You can prepare the Arrabiata sauce up to 3 days in advance but leave out the Shrimp. To serve, bring sauce to a boil over medium high heat, lower to medium, and toss in the uncooked Shrimp and allow to cook until opaque and firm. This should take 4-5 minutes. Sauce Ingredients: 1.5 Cups (12 oz) Basic Tomato Sauce -see recipe for Mario Batali's Basic Tomato Sauce by clicking HERE or use a quality jarred Marinara. I used jarred for the holiday. When attempting a big menu, it's good to go easy on yourself! Method: Bring a large pasta pot of salted water to a boil. In a very large skillet, warm oil over medium high heat. Add Garlic and dried Chiles. Next, add the Tomatoes with their Juice, the Basic Tomato Sauce, and Wine. Allow to simmer over medium heat, stirring periodically, until mixture thickens, about 8 to 10 minutes. Taste for seasoning and add Salt if needed or extra Crushed Red Pepper. I also like to finish it with a bit of Black Pepper. Turn off heat. Twenty minutes before you intend to serve this dish, prepare Pasta according to package directions. When it is about 5 or so minutes away from being done, bring the Sauce back to a gentle boil and toss in the Shrimp. Lower the heat to Medium and continue to cook several minutes (about 4 to 5), stirring occasionally,until the Shrimp are opaque and firm. When ready to plate, portion out your Pasta in each bowl, spoon Sauce over each, and pluck out several Shrimp to arrange on top. Optionally garnish with Basil or chopped Italian Parsley. Enjoy! 5 - 6 Days Before - Optionally Prepare Fresh Breadcrumbs. These can be stored in an airtight container in the fridge for several days. If you feel like skipping this step, most good bakeries sell their own fresh breadcrumbs. They store in the fridge for 3 days. A Day or 2 Before - Prepare Rao's Lemon Sauce and store in the fridge 2-3 days. Several Hours Before Guests Arrive - Brush Broiler Pan with a bit of the flavored Olive Oil. Place Fillets in Broiler Pan, cover with saran wrap and refrigerate. Set up your mis en place - Pre-measure the Lemon Sauce, Breadcrumbs, Wine, and Chop Butter into small dots and refrigerate. Set aside your Paprika and the remainder of your Flavored Olive Oil to brush tops of Fillets. This way, you'll be able to season and prep the Sole in minutes before cooking it in the broiler for guests. Start your prep 10 minutes before you'd like this meal to be served. Dust with flour and sprinkle Breadcrumbs over the top of each fillet and dot with butter. Season with Salt, Pepper, and Paprika. Serve immediately with a Lemon Wedge and Optional Parsley garnish. Spoon some of the pan juices alongside the fish. Heat oil in a small saucepan on medium-low heat. Add Garlic and slowly simmer until Garlic is just beginning to brown. Remove and discard Garlic. Pour Oil into a container and reserve, at room temperature, to use for frying or sautéing. Here we are, ready to plan this great menu. Believe me, this is really a no stress meal, as long as you think it through in advance and have one or two hours to spare for several days leading up to the big event. Feel free to organize yourself as you see fit since you know what works best for you, but here is how I attacked this meal, and I must say, I found it even easier than last year's Christmas Eve Dinner. Practice makes perfect. I also tried out two of the six fish dishes well in advance of making them for my guests to ensure that I felt comfortable executing the recipes. The remainder of the dishes were ones that I have cooked before. I highly recommend practicing in advance. Today's recipes all work extremely well and are nearly impossible to mess up, but there still is no substitute for the confidence you get when you've made a dish before. Wash all your plates and serving pieces if necessary (my china cabinet gets dusty!). Choose your table linens, and do any ironing of tablecloths, etc. Choose what plates you will be serving courses in. Label them with sticky notes. Choose which pots and pans you'll need and determine if you have enough pots. I had to borrow one this last time! Create your shopping list, preordering any ingredients that require advanced notice on holidays. Purchase Wine and other beverages, and any odds and ends you may need that aren't food such as cocktail napkins, etc. Make the Rao's Flavored Oil Oil and Breadcrumbs if you so choose. Make the Rao's Lemon Sauce ahead as well. Do all or almost all of the food shopping. It's ok if you have an ingredient or two to pick up in the morning the day of, such as Bread or one of the Fish that can't be prepped in advance, but do make sure you start working on the final cooking and prep at least 6 hours before guests arrive. Clean and devein the Shrimp. Set them aside in the fridge. Marinate the Mozzarella for the Wreath if you have not purchased it marinated already. Make the Arrabiata Sauce, but leave the Shrimp separate as they will be cooked in the Sauce the day of, just prior to serving. Wash and dry all your Vegetables, Herbs, and Lettuces so they are ready to go in the morning. That's the sort of thing that takes up your time when it is most precious - do not leave this 'til the last minute. Pick up any last minute food items. Place all pots and pans you will need on the counter or stove so they are ready to go (if you have room). Scrub the fresh Clams and put them back in the refrigerator. Prepare and toast the Croutons for the Zuppa di Clams and place in each serving bowl. Prepare the Zuppa di Clams broth, stopping right before the point where the second cup of Wine and the fresh Clams are added. Remove the mixture from the stove, let cool, and refrigerate until just before you must prepare the dish. Just pick up where you left off in the directions. The Zuppa di Clams, the Arrabiata (the Pasta must be boiled up and the Shrimp cooked in the reheated Arrabiata Sauce just before serving), and the Lemon Sole. Measure out any ingredients that can be pre-measured and left at room temperature or in the fridge. Label the containers. This includes the Breadcrumbs for the Lemon Sole. Prepare the Calamari Salad, dress it, and place in the fridge. Prepare the Rosemary Wreath - It can be left outside the fridge at room temp for a few hours. Up to two hours in advance, open up the Can of Lump Crab, toss with Lemon, Salt and Pepper, and place in the individual serving bowls atop the Frisee. Garnish each cocktail with Lemon, Chives and chill until ready to serve, and set out the Horseradish and Cocktail Sauce to serve on the side. 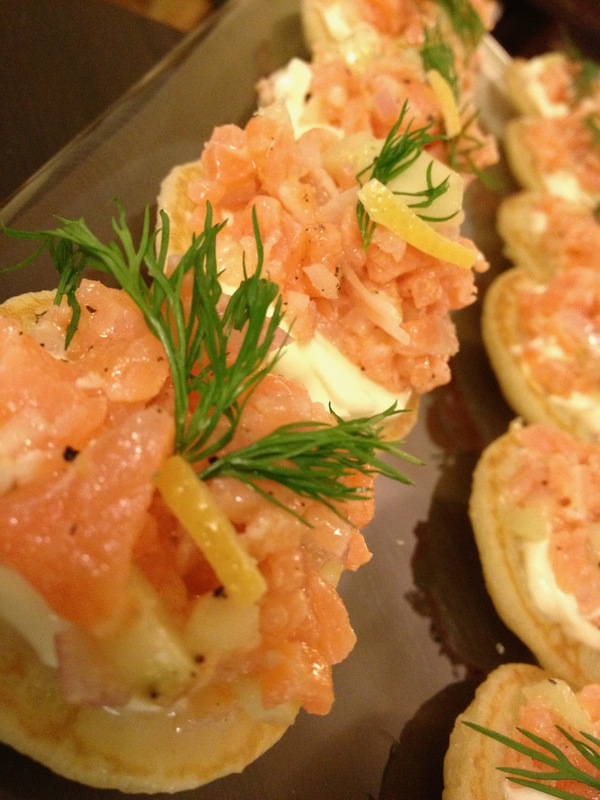 Prepare the Salmon Topping for the Blini Hors D'oeuvre and set it in the fridge. Assemble about a half hour before guests arrive by warming the Blini according to package instructions and topping them with Creme Fraiche, Salmon and Dill.The assembled Blini should be removed from the fridge 5 to 10 minutes before serving so they are close to room temperature or just slightly chilled. Finally, brush the Broiler Pan you'll be using to cook the Broiled Lemon Sole in with Flavored Olive Oil. Lay the fillets in the pan, cover with saran, and refrigerate until ready to cook. Before placing them in the broiler, dust them with Flour, Breadcrumb, Butter, and Paprika. You'll want to set aside pre-measured amounts of the preceding ingredients as well as the Lemon Sauce and Wine that must be added to the pan prior to cooking. I know this seems like a lot, but it really wasn't that bad. 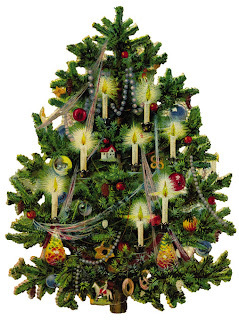 Happy cooking and see you in the New Year Pin It!